I know – the holidays just ended and I am talking about Fall already! But it is best to be prepared and you will be ordering fabrics soon so lets plan how to use them! 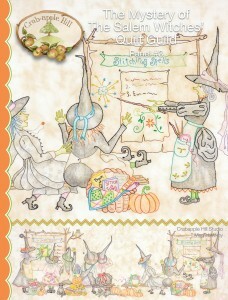 Witches Night Out by It’s Sew Emma is due to arrive in April and is a perfect class! Pieced pumpkins are repeated multiple times in the quilt – a great basis for each lesson. 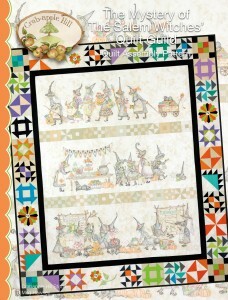 Other Halloween favorites are scattered throughout! Start collecting those oranges today! I ran into Kim from Kimberbell while we were setting up the booth and she told me that Broomhilda was visiting. 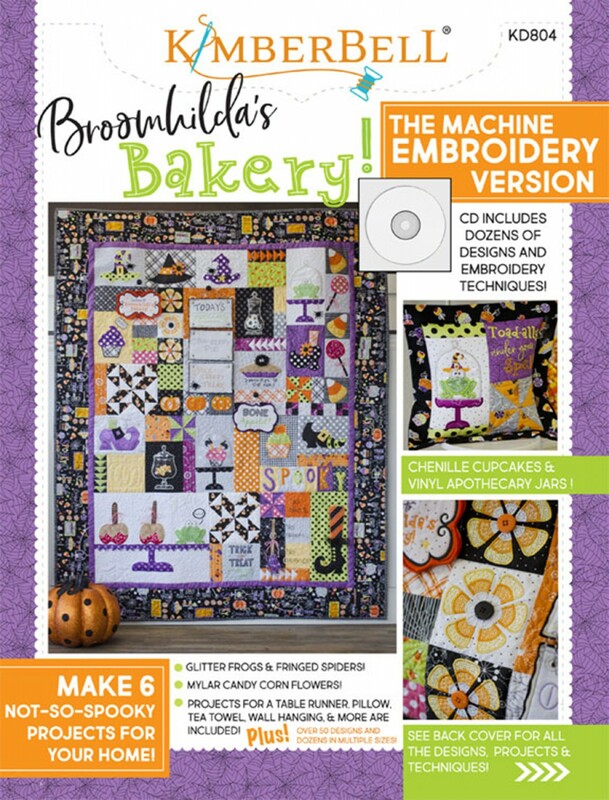 Kimberbell’s spook-tacular new quilt features: 26 embroidered blocks, Flying Geese (pieced in the hoop) and three more traditionally pieced blocks include Pinwheel, Four-patch, and Broomhilda’s twist on a Sawtooth block, which she calls the Sweet-tooth Star. Plus 4 pieced picture blocks, where the sections are embroidered separately, then applique images are aligned before piecing the blocks together to make a complete picture. The quilt can be made with the 4×4 and 5×7 hoop sizes. 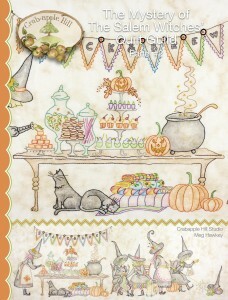 And, in typical Kimberbell style, she has included an embellishment kit that includes everything to make this sing! Don’t have an embroidery machine? It’s okay. there is a version for you as well! And, of course there is a fabric line to make it all oh so easy! Everything will be in stock by next month so plan your classes now! 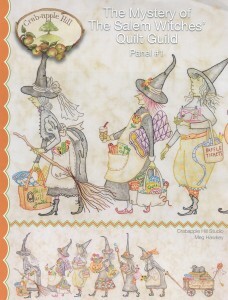 Many of you – including me – love everything designed by Meg Hawkey of Crabapple Hill Designs and have already started the Salem Witches Quilt Guild panel series. Drumroll please…….the final pattern in the series which explains how to put it all together will be arriving this month! This pattern includes the instructions for the blocks used in the sashings and borders used to complete the quilt top. And, to celebrate this release, the Witches decided to end the meeting with show and tell. This pattern is a stand alone which can be made to coordinate with this quilt. When the first three patterns ARE all in the top 20, you know these are going to be in high demand. And after those who didn’t commit in the beginning see this, they will want them ALL so order accordingly! It’s time to put away the flip flops and pull out all of the bolts of Fall colors and prints. Place them front and center – along with these top selling books and patterns – and you will be ready for the season! Or let Kimberbell inspire you…. This is a case of a picture is worth a thousand words – and several pictures are priceless! I love this combination of applique and piecing which is featured in the cover quilt as well as many of the projects inside…. Need’l Love combines rug hooking, embroidery, wool, and traditional piecing all in one book. And they have caught the Twister fever as well! The setting and colors in this quilt are spectacular but would be great in any colors. Or, feature their #1 pattern, Twister Jack…. Your shop will be all decked out for the season in a matter of minutes! School has started and Labor Day is over so that means Halloween is right around the corner! If you have been too busy with summer shop hops and events to think and plan for the next big holiday, we are here to help! Or, if you prefer to choose your own assortments, why not get a complete color card of their wools? This framed artwork from All Through the Night is a great wool project – and oh sew easy to kit! The perfect companion for these great wool projects is Valdani threads. Who could resist the variegated colors in this wonderful Fall assortment. The packaging of the wool and pearl cottons is so striking that your customers won’t even notice that you don’t actually have a sample done! And the display is just a few clicks away…. Yes, I know! You just celebrated Fourth of July and I am going to talk about Halloween! But, let’s face it, Halloween is the second biggest holiday – and all of those fabrics are sitting in your shop! And one of my favorite designers is releasing a new book this month that should be the showcase of your fall display! 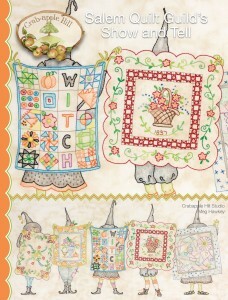 This book has it all – rustic Halloween motifs, contemporary projects that transcend any one season, and a variety of mediums that add texture and interest to everything! Your biggest problem is CHOOSING what projects you are going to make! And, don’t forget kits! You may want to order additional fabrics now…..
We had our first taste of a nip in the air in the Midwest this week which means Fall is right around the corner. Now is the time to spruce up your Halloween and Thanksgiving displays or you are going to miss those sales! Your customers are just getting in the spirit. School has started and they are ready to create. This does not have to be a big deal. In less than an hour, you can put together a great display. Showcase any Fall lines that you purchased. Walk through your shop and pull out all of the Fall colors and incorporate these into the display. Last year, you probably sold the focal fabric of those Fall lines but may still have some coordinates or tone on tones that will give a boost to the current line. Now is the time to let those earth tones shine!!! Don’t stop at fabric. Look at books and patterns as well – and supplement as needed. This is the easiest part. The covers often have seasonal vignettes that add to the charm of the display. Meg Hawkey is known for designing heirloom quality holiday projects that I love! You don’t have to make an entire sample. Have the current project you are working on in a hoop as part of the display. Seeing the quality of her designs is enough! Many of you are involved in secret sister programs or do a project with relatives during the holidays. This one is perfect – a pincushion and needle case that is luscious in wool. Why not choose from our great selection of wools from In the Patches – www.checkerdist.com/products/search?f_v=B397&page=1&limit=100&sort=score What an easy project to kit! This spell book reminds me of Harry Potter and makes me want to go for a family hike to find the perfect branch to decorate. This small project can be the centerpiece of the entire display – and the basis of a great class! Or this hat can be the center of a table top display. This will certainly attract your customer’s attention! What a great way to teach your customers embroidery stitches! Harvest Hopscotch is the perfect choice for your more traditional customers. Combining simple piecing with embroidery is the best of both worlds. Spellbound is the perfect project for all of us witches – or Harry Potter fans! Speaking of witches, who wouldn’t love this boot filled with all of your holiday favorites. If vintage is your style, Vintage Trick or Treat is just the ticket. Calendula Patterdrips is sure to become a family heirloom! And, don’t forget to include threads, flosses, embroidery needles; embroidery threaders; and hoops as a part of the display! Your customers will thank you for it!